It’s true, Vintage bicycles were more than just a way to get from point a to point b. Vintage bicycles were undoubtedly built for romance, plain and simple. One has only to look at vintage photographs and paintings to see this. Covers of books. Films. Magazines. Even the images in the poster ads for these beautiful beauties are romantic. Certainly the vintage bicycle was not quite as elaborate or easy to ride as the modern day bicycle. There are benefits to owning a modern bicycle now, most all filled with bells and whistles, gears and weightlessness, tires for multiple terrain, rust proof (for the most part). The Vintage bicycle had a presence. It had a seat that one could sit on without the worry of ones derriere being too hefty. There is definite weight to the vintage style bicycle. Not many can be found due to the fact that they were so well loved and used, especially those of the 30s and 40s. When researching vintage bicycles, I ran across Vin Vullo, who has been collecting and selling vintage bicycles since the 1960s. One of the many things he has to offer the public is his 16 part video series about vintage bicycles. He truly knows his bikes and knows how to keep your attention. This series is relatively simple and gives you some small and specific examples of vintage bicycles. You won’t find too many details about every single bike and type. This is definitely a generalization, though you will find some interesting specifics and the generalities are useful. Vin’s videos are short and sweet, at only about two minutes in length each. So in a half hour you’re through the series and knew a bit more than when you started. I did. Unfortunately as of 2018 I can’t find them online anymore. If anyone knows where they’ve gone let me know so I can share that information. I’d watched Identifying Vintage Balloon Tire Bicycles — powered by eHow.comHow to restore, what parts you need and how easy those parts are to find, how to tell what type and year a bicycle is, how valuable a bike might be and why, even identifying vintage balloon tires. These are the types of topics you’ll find. You’ll also be introduced to some simple lingo. I’d recommend this series for newbies. Collectors are probably already in the know about most of these topics. But you never know, you just may find a bit of information about Vintage bikes that you hadn’t come across before. The downside is the ads that begin some videos. But rest assured most are short. I must say, however, they do lack romanticism. It is always wonderful to find someone with a love and passion of vintage bicycles, especially when they are in the know. Vin is not the only one out there. In fact there are quite a few. 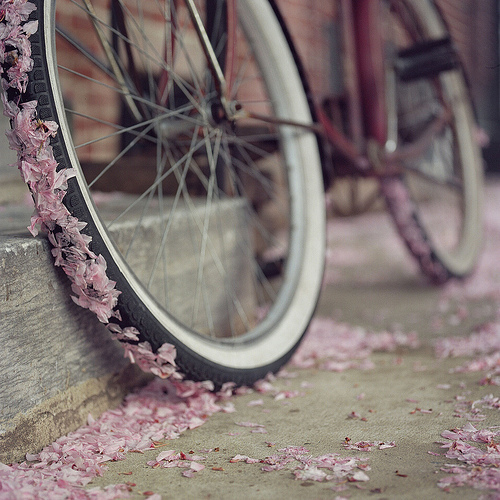 The blogging world, for one, is filled with vintage bicycle romantics with wonderful stories and enchanting photos. Here are some of my favorite romantic vintage bicycle photos I found on the web. Hope you enjoy them as much as I do. Lovely and romantic vintage bicycle photos from days gone by at Troubadour Vintage.